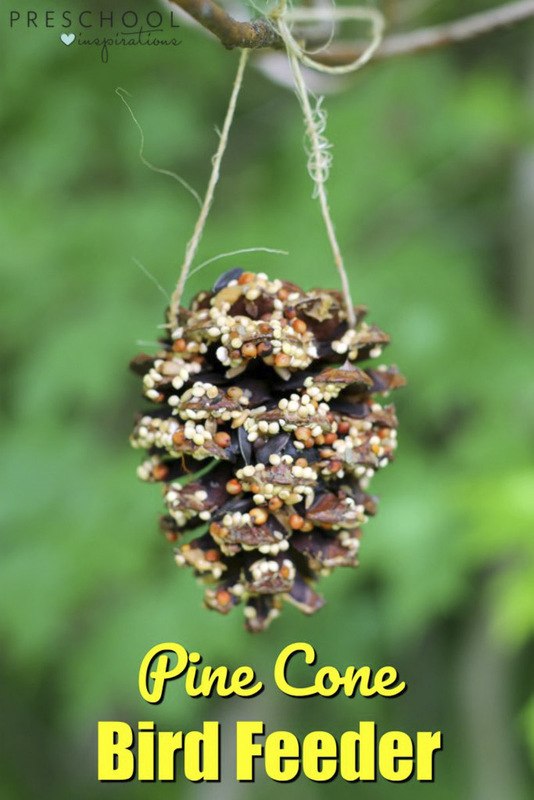 Make this simple and easy pine cone bird feeder as a perfect spring activity to connect with nature and find some new friends. After a very long winter, the sun is finally shining. We have been spending a lot of time outside and enjoying the warmer temperatures. On one of our recent nature walks, we discovered pine cones on the ground. 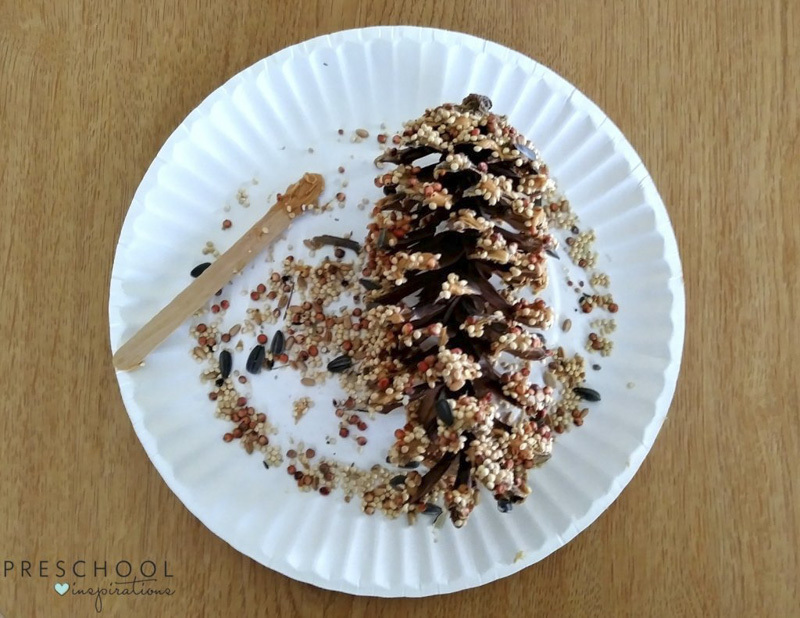 After each student picked one, we decided to make Pine Cone Bird Feeders for all of the birds returning from the south. These easy-to-make bird feeders are not only fun to make but they are inexpensive too. You can usually find all of the supplies that you need at your local dollar store. If you live in an area where you can’t find pine cones on trees, you can order them from Amazon. To prepare for this activity, scoop some peanut butter from the jar and put it into the small bowls. I usually have one bowl for every two or three students to share. Next, pour some bird seed into the small bowls. Then, give each student a paper plate or plastic tray. If you don’t have plates or trays, I recommend that you do this activity outside. Before beginning this activity, you may also want to cut the twine or string into pieces that are about 8 inches long for each student. 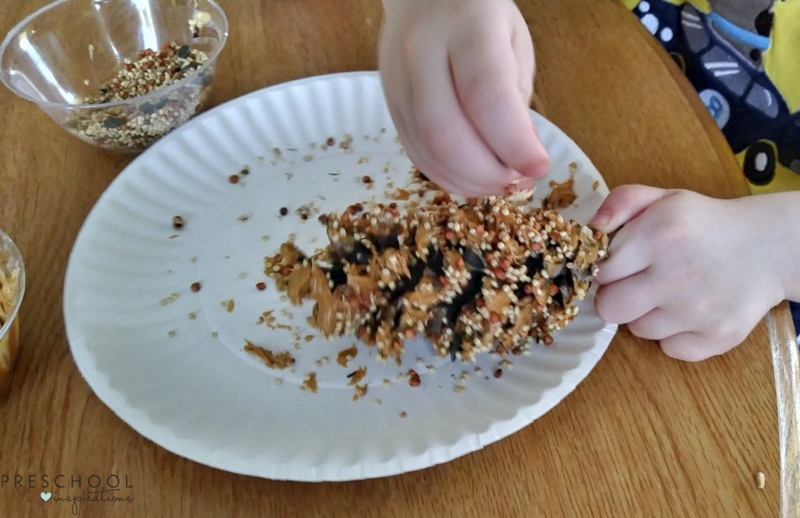 To begin making the pine cone bird feeders, your students will place their pine cone onto their paper plate or plastic tray and spread peanut butter on it. I have found that it is easiest for young children to spread the peanut butter with a popsicle stick. 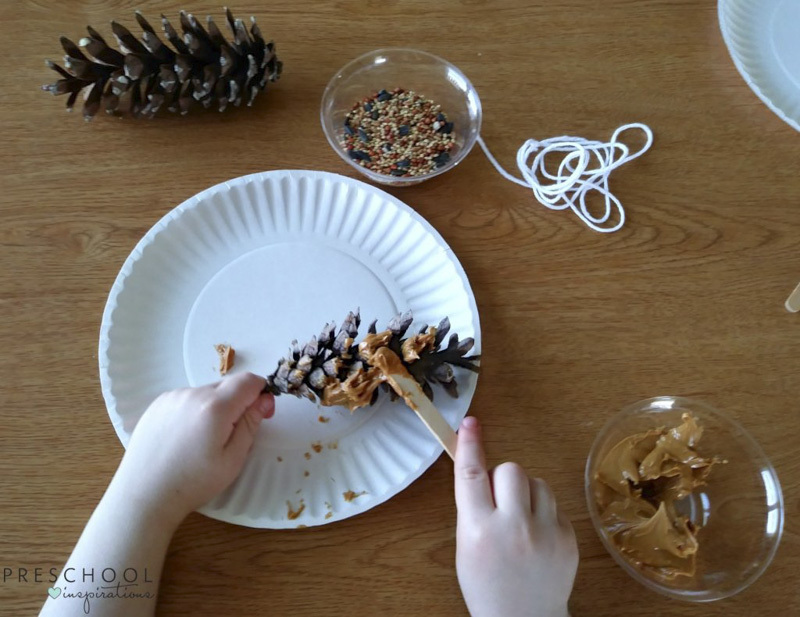 Next, the children will sprinkle the bird seed on the pine cone so it sticks to the peanut butter. 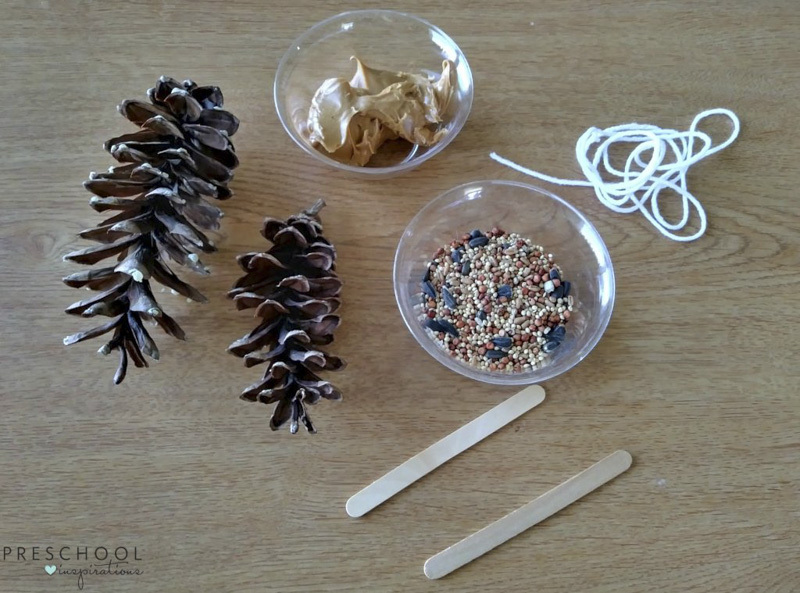 Your students can then tie the twine or string around the top of the pine cone and hang them from a tree or hook. 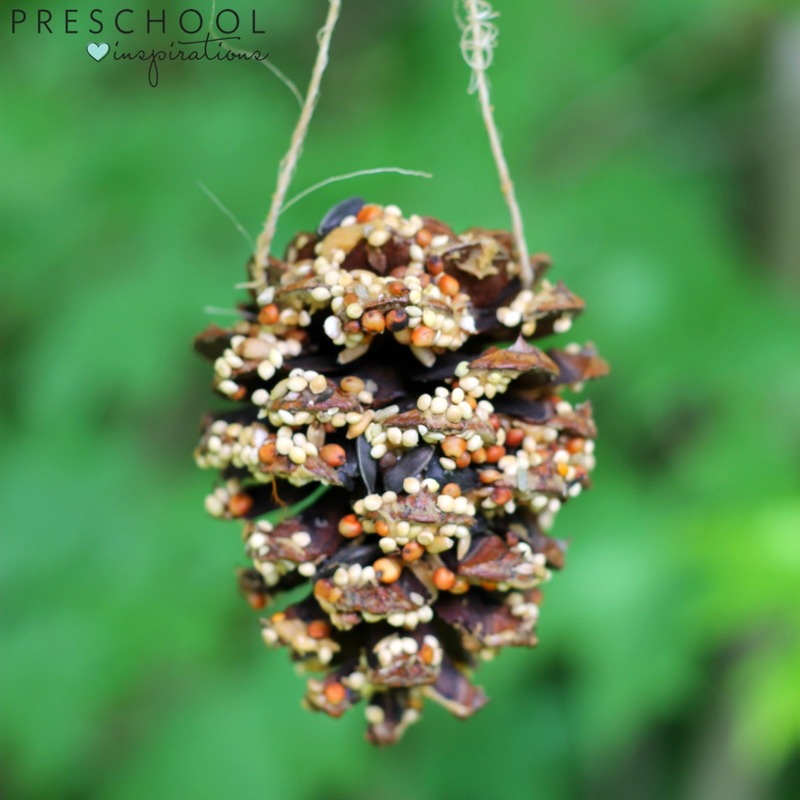 Making Pine Cone Bird Feeders is always one of our favorite activities during the school year. My students love to hang them outside our classroom window and watch all the different birds that come to visit.